Time, wind, water – all enemies of a cliff like this, made of sandstone – a soft rock rife with ancient seashells. Living nearby means living a watchful life, waiting for the next big storm and wondering what will still be standing come morning. A big thanks to Sandra Crook for her lovely photo this week! When had boys gotten so rude? Mabel dumped her sodden bags and shrugged off her Shetland sweater, rain drops beading up on the wool. Once, they’d have helped her up. Kicking her groceries was brutish to say the least. The world was a different place today. Back then, they’d watch her walk by with a sparkle in their eye. Today, she was old as the hills and almost as decrepit. The rain beat a pattern on her roof, wind kicking up along the strand. Mabel gazed wistfully at the sentinel down the beach, as she readied for the next storm. How times have changed, and not always for the better. Next time she should kick up a storm of her own! No, poor Mabel is thinking just that. Nothing is getting any easier! Thanks for reading! A bleak story for bleak times. Well done Erin, I sensed her helplessness. Yes, poor Mabel deserves better. I really enjoy the characters you create. This one is a real winner. As long as the house is there in the morning it’s all good – except maybe the grocery kicking. Thanks – darn kids have no respect for an old woman. A sad commentary on aging. Well written and heartbreaking. Thanks for reading, Rochelle. I’m slow on replies – but seeing a comment from you always makes me happy! It’s a cruel world. But she’s got the best house and views. Thanks for reading, Patrick. 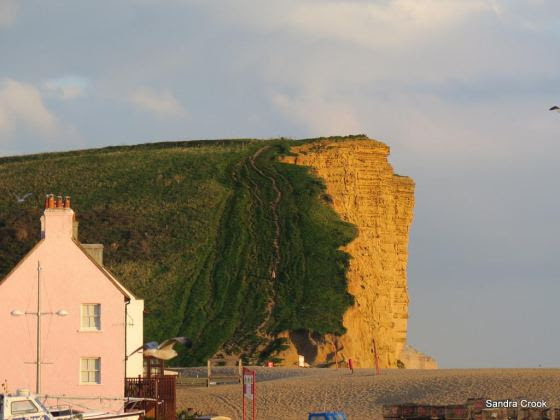 I’m now watching Broadchurch and see the cliffs that are pictured. Very cool! I like that idea! I’ll try it next time I’m confronted with impertinence. I hope to age with a little less bitterness and sadness. Poor Mabel. Me, too! Thanks for reading. Poor Mabel. There are still good kids out there, though. Thanks for reading – I agree, there are more good than bad, thankfully! Such a sad commentary on the world. At least a piece of it. Well written. I feel like Maple on some days. Those kids should have some respect. Beautifully written piece, Erin. Very well done. What kind of society only has value for nubile women? It’s a world I can’t live in. Thanks for reading!! I’m starting to feel a little like Mabel! Got unfriended by a young person on FB. Did I commit some error? 😦 🙂 Taking things much too personally. Sad!! But a big thank you for reading. I may sound old, but things really have changed! You capture it in a wistful, touching way, with this story, Erin. Lovely. Sadly, aging people experience the ignorance of the young too often. If they could see themselves in the elderly, perhaps, their attitude would change. I liked the direction you took for the prompt. We live in a world where respect seem to have died.. I love the details of the waterbeads on her sweater.